"The mountains don’t always give us what we want but they always give us what we need." Typically when a team arrives on top of a well-earned mountain summit, the moment is met with a loud chorus of yee-haws, high fives and bear hugs. I’ve been a part of many of those scenes on summits all over the world over the past 20 years. The 2014 Soldiers to Summits’ capstone expedition culminated last week with a summit of Mt. Whitney in California’s Sierra Nevada Mountains. At 14,505ft, it stands as the highest point in the contiguous United States. When I first accepted the role as the expedition leader for this years capstone trip, I have to admit that I was a little uninspired with the choice of Whitney. Clearly it doesn’t carry the allure or prestige of a Himalayan peak or the exotic nature of a mountain in the Andes. However, our main sponsor, Wells Fargo, had requested in their support of the expedition that we keep our training and peak objective within the borders of the lower 48 states. You bet… we can do that. In preparation for our final expedition in the Sierras, the team came together for two separate training exercises in the Rockies of Colorado. It quickly became very clear to me and my leadership team that this year’s group of injured veterans was remarkable. We had selected well. Each of them embodied the characteristics that we strive to recruit for each of our S2S experiences… maturity, a willingness to grow and heal, as well as a solid, collaborative energy. More so than any of the past iterations of S2S, this team was ready to charge forward with solid intent. We came together as a team during our trainings… we came together as a family while we were trekking towards Whitney. The week we spent together deep in the Sierra backcountry gave us the opportunity to embrace the mountains and each other… learning, growing and healing along the way. The mountains don’t always give us what we want but they always give us what we need. As the morning of September 11th dawned, all twenty of us stepped on to the summit of Whitney just as the nautical twilight was starting to cast its glow over the horizon. We took those final steps and gazed east, watching the day dawn over a country that is still hurting from those devastating events 13 years earlier. We paused to remember those that were lost both on that day and as a result of conflicts that sprang from the events of 9/11. In fact, the vast majority of the men and women on this trip had enlisted or were brought back to active duty as a result of that horrific day…. their lives changed forever. I’ve been on bigger and bolder mountains. I’ve been on tougher and colder mountains. 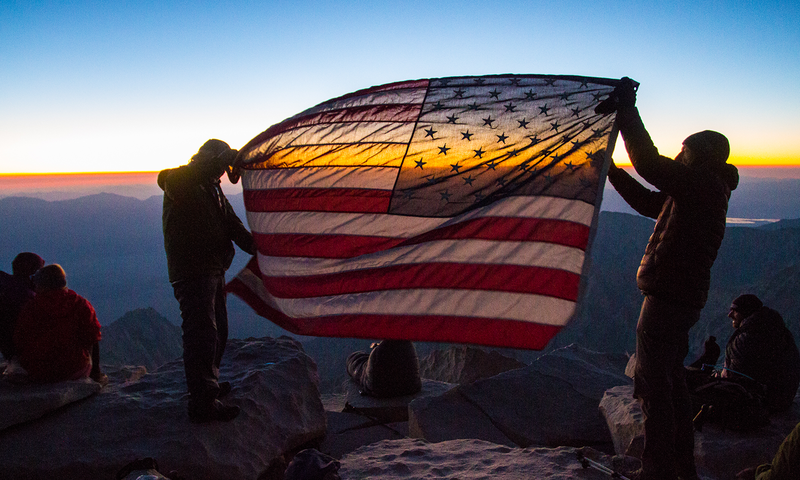 But I have never been as proud as I was that morning standing on top of that mountain with those men and women. Quietly. Solemnly. We hugged each other… one by one. Very few words were spoken. Many subtle smiles exchanged with a knowing glance. We knew why we were there. We were there to remember. To honor. To heal. Because it’s not about the mountain. It’s about the people. Thanks to Wells Fargo for providing us the chance to grow together.